Every man has a part of his face that he hates to shave – areas where he scrunches and stretches his face to ensure the razor makes contact with every hair, a universal phenomenon we call -Shave Face'. Gillette has joined forces with Steve Salecich, Shaving Expert, fifth Generation Barber and co-owner of Sydney's Grand Royal Barbers, to share a guide to Faceology (classification of those tricky facial contours) and top tips for achieving the perfect shave. Half cheek, half mouth, traumatised by years of being chaffed and cracked, where flashbacks of past shaves gone wrong still linger… Treat this patch of delicate mouth-face gingerly, or laughing will make you want to cry. Whether you shave up it or down it, across it or avoid it, approach -The Cliffhanger' with eyes wide open because this sensitive spot can leave even the most experienced man hanging. No-one fears this sensitive patch- it narrowly escapes our train of sensitive thought, until it gets touchy from all that -carrying on' and leaves you in silence - the most uncomfortable kind. This area sure sounds fun, but peering over the -half pipe' can be daunting. Shaving down it and right back up can really wear a man down. Just consider yourself lucky it isn't a full pipe. 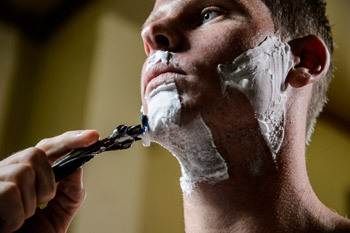 The softest part of the neck is often the hardest to shave. Underestimating those mushy flesh-lands can leave you as red as a freshly picked rose. It's the craw where the slightest mistake could leave you wrapped in the shame of a turtleneck. Understand which parts of your face are the most sensitive and hard to reach such as The Craw and Bunny Slope: this is vital for a precise and comfortable shave. Take time to work out the way your bristle grows on your face, most importantly your sensitive areas such as The Craw, Bunny Slope and Cliffhanger. Always follow the growth pattern of your hair to avoid irritation to the skin. Soften the bristle as best you can by having a warm shower, exfoliating and using a shaving gel designed for sensitive skin such as the Gillette Fusion Proglide Sensitive Shave Gel + Skincare 2-in-1 Ocean Cool. Taking the time to prepare properly will help in relaxing and softening the bristle to make it easier for the blade to run over the surface of your skin and those hard to reach terrains of the face. Once you have determined the growth of your bristle, move your face in the opposite direction from the growth and shave in the direction of the grain to achieve the ultimate close and precise shave. This is particularly helpful on the tricky terrain of the half-pipe, which most men push out using their tongue on the inside of their mouth. For the perfect shave, use a precisely engineered razor such as the Gillette Fusion ProGlide with FlexBall Technology. Apply little to no pressure on the blade, and let it glide across the face. The objective of the blade is to cut the hair shaft, not drag it. The innovative razor tackles contours with its unique Flexball, which enables the blade to pivot over the face like never before. After shaving, always wash residue from your face with cool water to help close pores and apply a moisturising balm to protect the skin, such as Gillette Series Intense Cooling Lotion. Remember to shave 3-4 times a week to avoid stubble getting too coarse and difficult to shave.